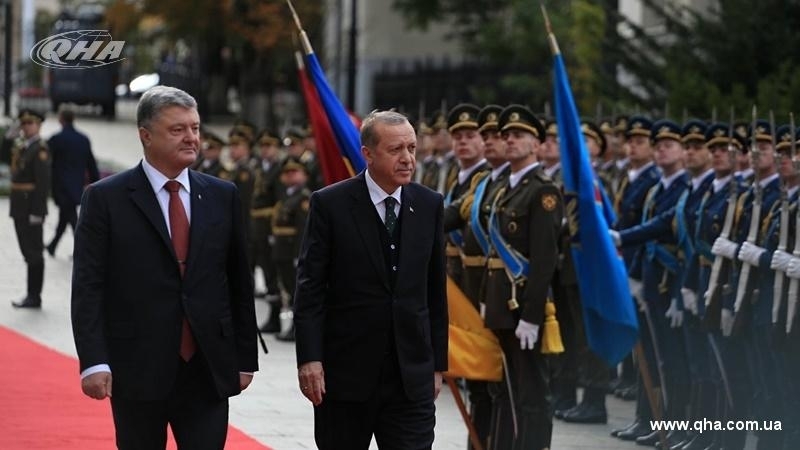 The Presidential Administration in Kyiv held an official ceremony of meeting the President of Ukraine Petro Poroshenko with the President of the Republic of Turkey Recep Tayyip Erdogan, QHA correspondent reports. The meeting had to be postponed for almost two hours due to the delay of the Turkish President. His wife Emine Erdogan came along with him in Ukraine. Reportedly, the presidential delegation include the Deputy Prime Minister Fikri Isik, the Chief of the General Staff Hulusi Akar, the Minister of Foreign Affairs Mevlüt Çavuşoğlu, as well as the ministers of defense, energy and natural resources, economy, construction, transport and communications, agriculture and industry, and the Minister for EU Affairs and Chief Negotiator Ömer Çelik . The official ceremony of the meeting of the Turkish President was attended by Ukrainian ministers, in particular ministers of infrastructure, education and foreign affairs of Ukraine, as well as the leader of the Crimean Tatar people Mustafa Dzhemilev. A joint statement of the Presidents of Ukraine and Turkey for media representatives is expected after the talks. One of the main topics of discussion will be the Crimean issue and the situation of the Crimean Tatars in the occupied Crimea. Erdogan also intends to meet with the Head of the Verkhovna Rada of Ukraine Andrei Parubiy and Prime Minister Volodymyr Groysman. After Kyiv, the Turkish delegation will go to Serbia. Within the framework of the visit in Kyiv, the sixth meeting of the High-Level Strategic Council between Ukraine and Turkey will be held under the co-chairmanship of Poroshenko and Erdogan. The sides will discuss ways to deepen bilateral cooperation in all strategic areas, as well as issues of international peace and regional security. Earlier, QHA reported that on September 26, Ankara hosted a meeting of representatives of the General Center of the Association of Culture and Mutual Assistance of Crimean Tatars of Turkey with the Prosecutor General of Ukraine Yuri Lutsenko, the Crimean Tatar leader, Presidential Commissioner for the Affairs of the Crimean Tatars Mustafa Dzhemilev, and the Prosecutor of the Autonomous Republic of Crimea Gunduz Mammadov. During the meeting the politicians discussed the issue of human rights violations in the Crimea occupied by the aggressor country, the annexation of the peninsula and the transportation of illegal goods from Turkey to Ukraine.